Those that survived wisely sought to isolate themselves. The possibility of contagion is simply too devastating. These small colonies are separated by distance and harsh inhospitable environment. Within the colonies a small sniff raises eyebrows. A coughing fit demands unpalatable decisions. The safety of the colony always triumphs, but some would protect it more zealously than others. 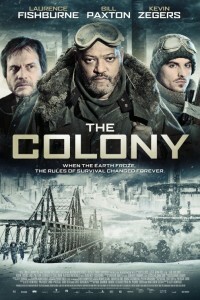 Briggs (Laurence Fishburne) rules Colony #7 with dignity and class, occasionally reigning in the more headstrong and impulsive Mason (Bill Paxton). Even when all seems hopeless. Where young adults have lived lives never having seen the sun. We always make the decision for the greater good. A distress signal from Colony #3 brings new decisions. To stay and tend to your own yard, or to risk it all helping others? Intriguing no? Well shelve all thoughts of arty Snowpiercer like alternative post apocalyptic intrigue, were sticking with the low road from here. The Colony steals from many films and as a result comes across as a lazy melange of genres and themes. Obviously influenced by the aforementioned Snowpiercer and to a lesser extent I Am Legend in the first half, the second half is 30 Days of Night crossed with Alien 3, the dual threats of isolation and a determined and very savage enemy. The Colony though never manages to build tension or suspense though, so while it changes the menu ever so slightly, this is just another dull weekend barbecue in a different backyard. Final Rating – 5.5 / 10. Surely a cinema legend like Laurence Fishburne deserves better than this?